Steel is durable and strong. Unlike wood, steel is not susceptible to shrinkage, and will not warp with age. It's thanks to steel that buildings can be built more than four stories high. 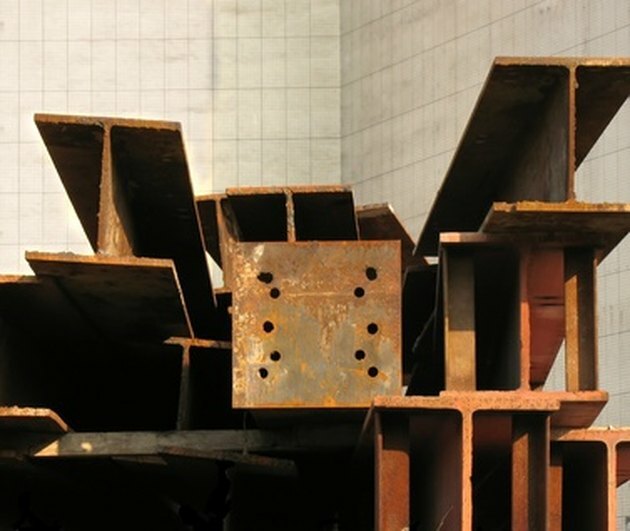 Steel is an important building component. Steel is made by a process called smelting. Iron is heated to the point where it becomes molten. Air is then pushed through it to remove the carbon and silicon. Then molten manganese, called spiegel, is added. At this point, it can shaped and molded into girders or beams. Once the molten mixture cools, it becomes steel. Fourteen-gauge steel is .0747 inch thick. The higher the gauge, the thinner the steel. Thin steel is easier to work with because it has more give. However, it is not as strong as lower gauge steels. A carport built out of 14-gauge steel will be lightweight, but may bend over time if a large amount of snow consistently falls on top of it. Twelve-gauge steel is thicker and, therefore, more sturdy. The exact thickness is .1046 inches. While thicker steel can hold more weight, it is harder to work with, since it doesn't have the same give that thinner steel has.